Welcome to the Sam Houston Chapter, NSDAR. We are a rapidly-growing chapter with over 200 members, and there is something for everyone at whatever level she is able to participate. 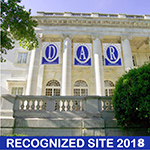 DAR is a non-profit, non-political volunteer service organization comprised of women who are direct lineal descendants of American Revolutionary War patriots. Our goals are historic preservation, education and patriotism. The Sam Houston Chapter, NSDAR supports schools in local districts. In promoting education and good citizenship in our schools, our members present youth citizenship awards to 5th graders in each elementary school. We also promote American history and good citizen essay programs in its high schools through annual scholarship awards, along with awarding annual ROTC medals. Being strongly patriotic, we support several projects for our veterans, including collecting and donating items to VA hospitals, Stand Down for Homeless Veterans, our local homeless veterans Christmas party. We place over 800 flags on the graves of veterans each year. Women 18 years of age or older who can prove direct lineal descent from an ancestor who aided in achieving American independence are eligible for membership. We have members who can help you with your genealogy and in locating your patriot ancestor. Our chapter meets the first Saturday of each month at 10 a.m.
For technical problems with this page, contact our webmaster. Last updated on 04/08/18. The content contained herein does not necessarily represent the position of the NSDAR. Hyperlinks to other sites are not the responsibility of NSDAR, the state organizations, or individual DAR chapters.